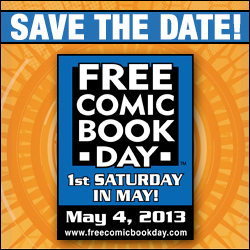 It's just around the corner, that's right -- Free Comic Book Day 2013. We want to make sure you block off the entire day of May 4, 2013 to enjoy the geek trifecta of events. If you've never been to a roller derby bout, you don't know what you're missing! The high energy required for this fast-paced sport will thrill you. You'll also enjoy the style, finesse and power that these athletes bring to the rink. We are proud to sponsor the Sac City Rollers this year. As part of that, at each bout, you'll have the opportunity to win prizes donated by Empire's and other sponsors when you purchase a raffle ticket at the bout. Tickets are available online, so watch the Sac City Rollers website for more details. Bouts take place at The Rink, 2900 Bradshaw Road, Sacramento, CA. Details have not been posted yet, however the bout will likely start sometime between 6:30-7:00 p.m.